Richard Wright (September 4, 1908 - November 28, 1960), like many creative writers, published poetry early on. His works appeared in Leftist magazines. Later, he produced a collection of short stories, Uncle Tom's Children, and then he gained widespread attention with Native Son (1940). He went on to publish several other works, and he has become known as one of our most prominent and critically acclaimed writers. 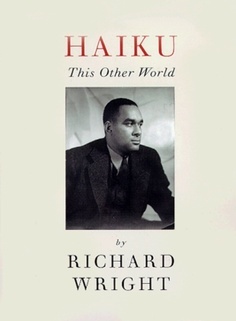 Several years after Wright's death, a collection of his haiku were released. Who knew that the author of The Outsider, 12 Million Black Voices, Black Power, and Black Boy also wrote haiku? The haiku added another dimension to my intrigue with this writer who emerged. I was especially fascinated to learn how deeply he immersed himself in the art form. Wright had been introduced to haiku in the summer of 1959, note Yoshinobu Hakutani and Robert L. Tener in the afterword to Haiku: The Last Poems of an American Icon. By 1960, at the time of his death, Wright had composed 4,000 haiku. "One of that her last memories of her my father during the summer and autumn months before he died," notes Wright's daughter Julia, "is his crafting of thousands of haiku. He was never without his haiku binder under his arm." Wright was suffering from an illness toward the end of his life, and during his extended time in bed, he wrote haiku. Wright's Haiku contain 817 of the approximately 4,000 that he wrote. He had prepared those that were published as a book entitled, which he entitled This Other World: Projections in the Haiku Manner. There are numerous links between Wright's haiku and his early writings, especially his attention to nature. At the same time, in terms of genre, there's something to be gained by thinking of his "projections" in this mode as some kind of "other world."